Prometheus Bound, a tragedy traditionally attributed to the famous Athenian playwright Aeschylus (c. 525 BC – c. 456 BC) is the most famous dramatic depiction of one of the most important mythic figures among the ancient Greeks. Prometheus, a Titan, one of the family of deities preceding Zeus, helped Zeus overthrow his father, Cronos, and usher in the rule of the Olympian gods. However, when Prometheus stole fire from heaven and gave it to human beings, Zeus turned against him. In addition, Prometheus had learned of a secret that would lead to Zeus’ downfall. 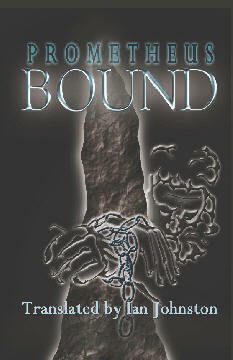 In order to extract this secret, Zeus decides to inflict a horrific punishment of Prometheus. However, the Titan will not give way and vows to defy Zeus by not revealing his secret, no matter what the cost. Aeschylus’ play, apparently the first in a trilogy (the other two plays are lost), depicts the beginning of Prometheus’ long punishment and is famous for the way it expresses the Titan’s unflinching defiance and emphasizes the harsh tyranny of Zeus’ new rule in heaven (not merely by what happens to Prometheus). These two qualities help to define a characteristically tragic Greek heroic attitude to suffering and divine rule, something very much at odds, as Friedrich Nietzsche pointed out, with the important Biblical founding myth of Adam and Eve. Ian Johnston’s new translation is an accurate and dramatically vivid version of this famous work. The text contains explanatory footnotes for readers who need assistance with the mythic and geographical references.